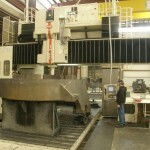 K&M machines large fabricated and cast engine blocks. We can machine an engine block complete or we can perform specific operations to supplement our customers’ machining capacity. Our large vertical gantry mills and large horizontal boring mills equipped with right angle and universal heads and spindle extensions give K&M the versatility and reach needed for complex machining. We fabricate and machine oil pans and skids for generator sets that are used on land and at sea. K&M capabilities to burn, weld, machine, paint, and 100% inspect make us an ideal partner for contract manufacturing of large and heavy components for the power generation industry. 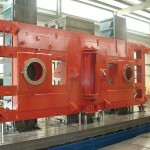 K&M has the capability to provide large fabrications and large machining services for the oil and gas industry. 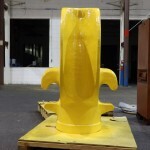 We are currently providing series production large machining services for jack up rigs and for roughing of fluid ends. Certification of welding processes by third party witness is a requirement of oil and gas industry customers. K&M has a robust ISO 9001:2008 quality system in place that meets the requirements of oil and gas industry customers. K&M supplies fabricated and machined bases, gantries, frames and other components for customers in the machine tool industry. Like other industries the US machine tool industry competes with off shore suppliers. Companies, like K&M, that supply to the US machine tool industry face the same offshore competition. K&M offers quick delivery times, competitive total cost and high quality that make US sourcing of large machined fabrications the right choice for US machine tool manufacturers. The large vertical gantry mills and large boring mills with right angle and universal heads and spindle extensions can often machine a large component in a single setup. This reduces machining variation and delivers high accuracy for location, perpendicularity and parallelism of machined surfaces. K&M supplies large fabrication and large machining services to some of the largest global mining equipment suppliers. The large components supplied by K&M are used in above ground and underground mining equipment. The above ground mining truck applications range from 35 ton to 400 ton capacity mining trucks; additionally, K&M also supplies components for the large wheel loaders to service these trucks. The underground applications include cutter heads for continuous miners and large components for long wall miners. Capability to 100% dimensionally inspect these components is very important to mining equipment customers. K&M has the large inspection capabilities that are required. K&M’s experience in the wind power industry includes fabrication and machining for some of the largest suppliers of wind turbines in the world. The harsh service environment and remote location of wind turbines mandate that component parts are manufactured to the highest quality standards. Many wind turbine components are ductile iron castings. K&M has extensive experience in machining ductile iron castings. This includes wind turbine bases and hubs. 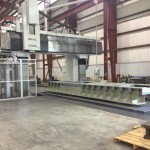 K&M has provided large fabrication, machining and assembly services for the construction industry. Large components produced include booms and sticks for cranes and car bodies and operators cabs for construction cranes. K&M has machined several models of frames for agricultural vehicles. 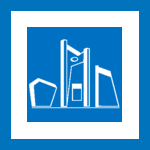 We also have the capability to fabricate these structures. There have been several occasions where the manufacturer of agricultural vehicles had a gap between demand for a product and the availability of in-house capacity. K&M tooled up existing capacity in a short lead time to fill this gap and allow the manufacturer to meet customer demand while in-house capacity was brought on-line. 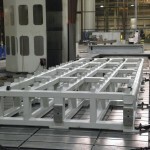 K&M has also machined prototype frames so that the equipment manufacturer could avoid interruption of production machining to produce prototypes. K&M’s has open capacity to meet our customers’ short term needs. 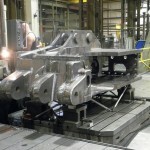 K&M provides large fabrication and machining services for the locomotive industry. Our portfolio includes steering beams, air boxes and oil pans.